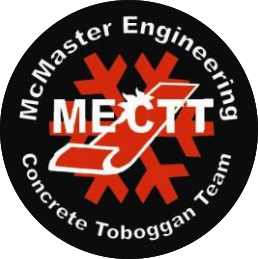 The McMaster Engineering Concrete Toboggan Team started in 1992, and has been getting stronger ever year since. Starting with a team of only 18 dedicated members, the team has grown to well over 100. In 2006, McMaster was the first ever recipient of the fastest toboggan on a curved track. This was quite the accomplishment and will forever go down in Concrete Toboggan history. In previous years, the toboggan only had to go straight down the hill. In order to change things up, the GNCTR crew added on the curved track as an optional course. With a custom designed steering mechanism, we were able to ride our way to the top! At the 2007 race in Winnipeg, McMaster’s toboggan was deemed “World’s Fastest Concrete Toboggan”, clocking in at 69.3 km/h. In recent years, MECTT has been concentrating our efforts on designing sustainable concrete mixes by utilizing various polymer aggregates and fibres. We are using cementitious replacement such as fly ash and calcium carbonate fines in the form of betorcarb. We are also using litex as well as recycled crushed concrete as traditional aggregate replacement, in order to achieve a green concrete design.